Gold level braces mouthguard for fixed brace wearers. Superior impact protection thanks to a dual layer construction. What is the Gold Braces Mouthguard? 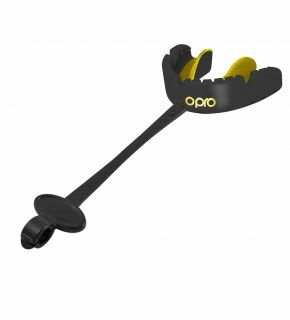 The OPRO Gold Level Braces Mouthguard is specially made for wearers of fixed braces. Available in a range of colours, and suitable for ages 10+, it’s great for those who participate in any ball, stick or combat sport. Each mouthguard also comes with anti-microbial additive in the mouthguard itself and the case too. This protects against the build-up of up to 99.99% of bacteria growth. The fitting process makes this gum shield second to none when it comes to protection for those who wear fixed braces. The mouthguard itself also has anti-microbial protection as standard in all Gold levels. How do I fit my mouthguard for braces? 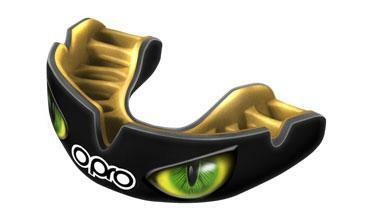 Fitting your OPRO Braces Mouthguard is simple and easy. Each mouthguard has shortened fins and a unique brace bumper. All of this means you have a secure, tight and most importantly, a comfortable fit that provides unrivalled protection. Each pack comes with our very own fitting cradle. 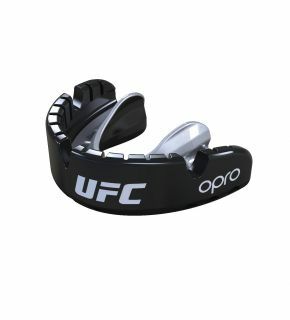 This makes fitting simple and as long as you follow the instructions in the fitting video or on the pack, you will be left with a mouthguard individual to you that protects like only a OPRO mouthguard can. What makes this different to other mouthguards for braces? There are many mouthguards for braces available, however none offer the secure fit and protection level that we do. The fins and brace bumper provide a highly retentive fit after moulding, and the dual layer construction of the outer layer, ensures that you stay protected. These 2 key points cannot be found in any other gum shields for braces brand. The mouth guard also comes with special stretch zones to make sure it doesn’t pinch your gums. Ordering online from OPROMouthguards.com is secure and only takes a few moments. Add your products to your basket and follow the checkout process. Want your mouthguard tomorrow? No problem at all! As long as you place your order by 3pm on a working day, you can start experiencing the benefits of an OPRO Mouthguard from tomorrow!